The book includes 19 gorgeous patterns, all worked in the round. There is something for everybody - from the quick and easy "Lazy Daisy Shoulder Bag" to the stunningly intricate "Winnie's Wonderland Blanket" - and everything from coasters to cushions, runners and mats in between. The photos of each project are colourful and beautifully styled, while the patterns are well written and easy to follow. In addition to the written pattern each project is accompanied by a neat chart. My favourite project is the Winnie's Wonderland Blanket!! A colour chart is provided for both the Pink and Blue blankets - I would love to make the pink one for my granddaughter who is due next year. I chose Stylecraft Batik and Stylecraft Life DK with a 3.50mm hook for my project. The "mandala" portion of the blanket is perfect for a round cushion, which will sit just right on a vintage occasional chair! UPS managed to "misplace" my copy of the book and so I did not have enough time to complete my cushion, but ......... I love how it is shaping up so far! There are still a few stops to make on this blog tour - so be sure to follow along. 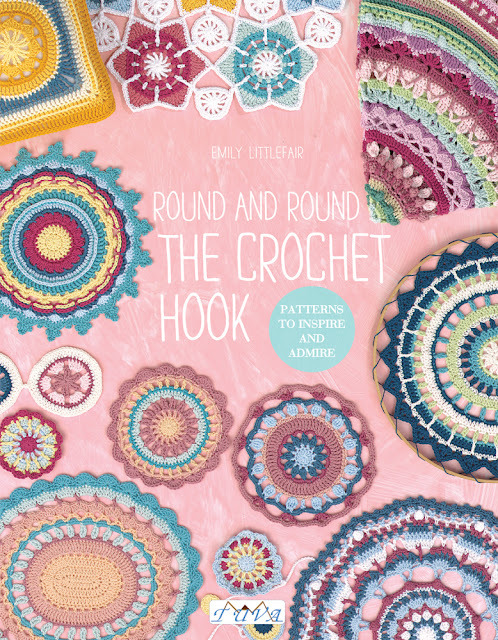 Visit Emily @ The Loopy Stitch for a chance to win one of two signed copies of this inspiring book!